The Iron Brigade, also known as the Iron Brigade of the West or the Black Hat Brigade, was an infantry brigade in the Union Army of the Potomac during the American Civil War. Although it fought entirely in the Eastern Theater, it was composed of regiments from Western states (states that are today considered Midwestern). Noted for its strong discipline, its unique uniform appearance, and its tenacious fighting ability, the Iron Brigade suffered the highest percentage of casualties of any brigade in the war. The nickname "Iron Brigade", with its connotation of fighting men with iron dispositions, was applied formally or informally to a number of units in the Civil War and in later conflicts. The Iron Brigade of the West was the unit that received the most lasting publicity in its use of the nickname. 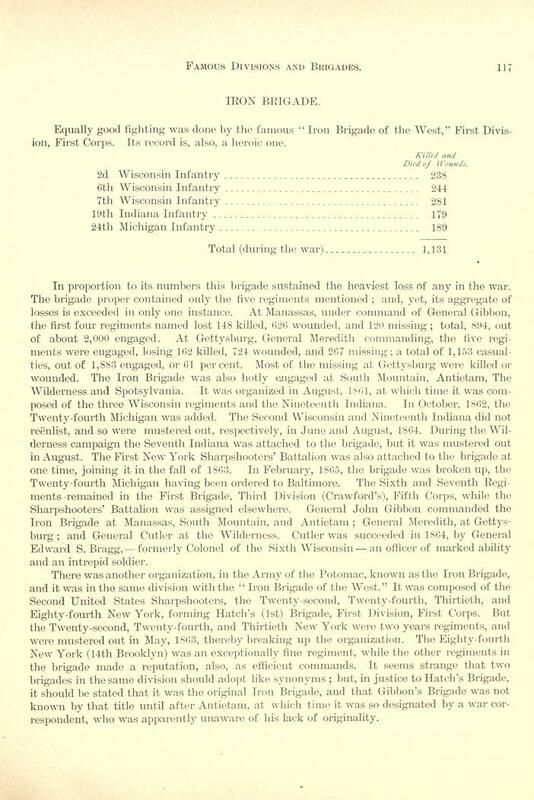 The Iron Brigade initially consisted of the 2nd, 6th, and 7th Wisconsin Volunteer Infantry Regiments, along with the 19th Indiana, and was later joined by the 24th Michigan. This composition of men from three Western states led it to be sometimes referred to as the Iron Brigade of the West. They were known throughout the war as the Black Hats because of the black 1858 model Hardee hats issued to Army regulars, rather than the blue kepis worn in most other units. Equally good fighting was done by the famous "Iron Brigade of the West," First Division, First Corps. Its record is, also, a heroic one. In proportion to its numbers this brigade sustained the heaviest loss of any in the war. The brigade proper contained only the five regiments mentioned; and, yet, its aggregate of losses is exceeded in only one instance. At Manassas, under command of General Gibbon, the first four regiments named lost 148 killed, 626 wounded, and 120 missing; total, 894, out of about 2,000 engaged. At Gettysburg, General Meredith commanding, the five regiments were engaged, losing 162 killed, 724 wounded, and 267 missing; a total of 1,153 casualties, out of 1,883 engaged, or 61 per cent. Most of the missing at Gettysburg were killed or wounded. The Iron Brigade was also hotly engaged at South Mountain, Antietam, The Wilderness and Spotsylvania. It was organized in August, 1861, at which time it was composed of the three Wisconsin regiments and the Nineteenth Indiana. In October, 1862, the Twenty-fourth Michigan was added. The Second Wisconsin and Nineteenth Indiana did not reenlist, and so were mustered out, respectively, in June and August, 1864. During the Wilderness campaign the Seventh Indiana was attached to the brigade, but it was mustered out in August. The First New York Sharpshooters' Battalion was also attached to the brigade at one time, joining it in the fall of 1863. In February, 1865, the brigade was broken up, the Twenty-fourth Michigan having been ordered to Baltimore. The Sixth and Seventh Regiments remained in the First Brigade, Third Division (Crawford's), Fifth Corps, while the Sharpshooters' Battalion was assigned elsewhere. General John Gibbon commanded the Iron Brigade at Manassas, South Mountain, and Antietam; General Meredith, at Gettysburg; and General Cutler at the Wilderness. Cutler was succeeded in 1864, by General Edward S. Bragg,-- formerly Colonel of the Sixth Wisconsin -- an officer of marked ability and an intrepid soldier. Total Civil War Losses in Killed and Mortally Wounded 1,131. An additional several hundred died of disease and while in Confederate prisons, and several hundred more returned home wounded. There was another organization, in the Army of the Potomac, known as the Iron Brigade, and it was in the same division with the "Iron Brigade of the West." It was composed of the Second United States Sharpshooters, the Twenty-second, Twenty-fourth, Thirtieth, and Eighty-fourth New York, forming Hatch's (1st) Brigade, First Division, First Corps. But the Twenty-second, Twenty-fourth, and Thirtieth New York were two years regiments, and were mustered out in May, 1863, thereby breaking up the organization. The Eighty-fourth New York (14th Brooklyn) was an exceptionally fine regiment, while the other regiments in the brigade made a reputation, also, as efficient commands. It seems strange that two brigades in the same division should adopt like synonyms; but, in justice to Hatch's Brigade, it should be stated that it was the original Iron Brigade, and that Gibbon's Brigade was not known by that title until after Antietam, at which time it was so designated by a war correspondent, who was apparently unaware of his lack of originality. In June 1865, the units of the surviving brigade were separated and reassigned to the Army of the Tennessee. The brigade had fought in the Second Bull Run, Antietam, Fredericksburg, Chancellorsville, Gettysburg, Mine Run, Overland, Richmond-Petersburg, and Appomattox campaigns. The Iron Brigade suffered a total of 1131 in killed and mortally wounded, approximately 500 more died of disease, and several hundred returned to their respective home state wounded, disabled, and disfigured. The brigade took pride in its designation, "1st Brigade, 1st Division, I Corps", under which it played a prominent role in the first day of the Battle of Gettysburg, July 1, 1863. It repulsed the first Confederate offensive through Herbst's Woods, capturing much of Brig. Gen. James J. Archer's brigade, and Archer himself. The 6th Wisconsin (along with 100 men of the brigade guard) are remembered for their famous charge on an unfinished railroad cut north and west of the town, where they captured the flag of the 2nd Mississippi and took hundreds of Confederate prisoners. The Iron Brigade, proportionately, suffered the most casualties of any brigade in the Civil War. For example, 61% (1,153 out of 1,885) were casualties at Gettysburg. Similarly, the 2nd Wisconsin, which suffered 77% casualties at Gettysburg, suffered the 3rd highest total throughout the war; it was third behind the 24th Michigan (also an Iron Brigade regiment) as well as the 1st Minnesota in total casualties at Gettysburg. The Michigan regiment lost 397 out of 496 soldiers, an 80% casualty rate. The 1st Minnesota Regiment actually suffered the most casualties of any unit in the Civil War during the battle of Gettysburg losing 216 out of 262 men (82%) on day 2 of Gettysburg. The Iron Brigade and Black Hat Brigade are names forever synonymous with the relentless fighting spirit exhibited during the nation's trial by fire. For the Iron Brigade had been baptized with multiples fires, tried and forged like blazing steel during years of shot and shell, and had fought as a band of brothers who had been formed and fashioned into a solidified unit that had been made of hot iron. Its name, its legacy, is forever burned into the annals of history. Another brigade in the Army of the Potomac had previously been known as the Iron Brigade (later the Iron Brigade of the East or First Iron Brigade to avoid confusion). This unit was the 1st Brigade, 1st Division, I Corps, prior to Meredith's brigade getting that designation. It consisted of the 22nd New York, 24th New York, 30th New York, 14th Regiment (New York State Militia), and 2nd U.S. Sharpshooters. Although this Iron Brigade of the East served in the same infantry division as the Iron Brigade of the West, press attention focused primarily on the latter. Most of the Eastern regiments were mustered out before the Battle of Gettysburg, where the remaining Eastern Iron Brigade Regiments and the Iron Brigade of the West arguably achieved their greatest fame. A Confederate cavalry brigade was known as Shelby's Iron Brigade. It was in the division commanded by Brig. Gen. Joseph O. (Jo) Shelby in the Army of Missouri and fought in Maj. Gen. Sterling Price's Missouri Expedition in 1864. Recent scholarship identifies two other brigades referred to by their members or others as "The Iron Brigade": 3rd Brigade, 1st Division, III Corps (17th Maine, 3rd Michigan, 5th Michigan, 1st, 37th, and 101st New York); Reno's Brigade from the North Carolina expedition (21st and 35th Massachusetts, 51st Pennsylvania, and 51st New York). Drawing upon a wealth of sources, including dozens of previously unpublished accounts, Herdegen details for the first time the exploits of the 2nd, 6th, 7th Wisconsin, 19th Indiana, and 24th Michigan regiments during the entire campaign. On July 1, the Western troops stood line-to-line and often face-to-face with their Confederate adversaries, who later referred to them as "those damned Black Hats!" With the help of other stalwart comrades, the Hoosiers, Badgers, and Wolverines shed copious amounts of blood to save the Army of the Potomac's defensive position west of town. 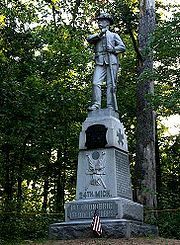 Their heroics above Willoughby Run, along the Chambersburg Pike, and at the Railroad Cut helped define the opposing lines for the rest of the battle and, perhaps, won the battle that helped preserve the Union. Herdegen's account is much more than a battle study. The story of the fighting at the "Bloody Railroad Cut" is well known, but the attack and defense of McPherson's Ridge, the final stand at Seminary Ridge, the occupation of Culp's Hill, and the final pursuit of the Confederate Army has never been explored in sufficient depth or with such story telling ability. Herdegen completes the journey of the Black Hats with an account of the reconciliation at the 50th Anniversary Reunion and the Iron Brigade's place in Civil War history. "Where has the firmness of the Iron Brigade at Gettysburg been surpassed in history?" asked Rufus Dawes of the 6th Wisconsin. Indeed, it was a fair question. The brigade marched to Gettysburg with 1,883 men in ranks and by nightfall on July 1, only 671 men were counted. It would fight on to the end of the Civil War, and do so without its all-Western composition, but never again was it a major force in battle. Some 150 years after the last member of the Iron Brigade laid down his life for his country, the complete story of what the Black Hats did at Gettysburg and how they remembered it is finally available. Sources: The Union Army; Official Records of the Union and Confederate Armies; Fox, William F. Regimental Losses in the American Civil War (1889); Dyer, Frederick H. A Compendium of the War of the Rebellion (1908); Beaudot, William J. K., and Herdegen, Lance J., In the Bloody Railroad Cut at Gettysburg, Morningside, 1990, ISBN 0-89029-535-7; Dorsey, Chris "Of Iron and Stone: A Comparison of the Iron and Stonewall Brigades," The Journal of America's Military Past, (Winter, 2001); Eicher, John H., and Eicher, David J., Civil War High Commands, Stanford University Press, 2001, ISBN 0-8047-3641-3; Fox, William F., Regimental Losses in the American Civil War, reprinted by Morningside Bookshop, Dayton, Ohio, 1993, ISBN 0-685-72194-9; Herdegen, Lance J., The Men Stood Like Iron: How the Iron Brigade Won Its Name, Indiana University Press, 1997, ISBN 0-253-33221-4; Nolan, Alan T., The Iron Brigade, A Military History, Indiana University Press, 1961, ISBN 0-253-34102-7.